LES SABLES D’OLONNE, FRANCE (February 22, 2017) – The Cruising Club of America (CCA) is particularly proud of member Rich Wilson’s (Marblehead, Mass.) accomplishment in the just completed Vendée Globe race. 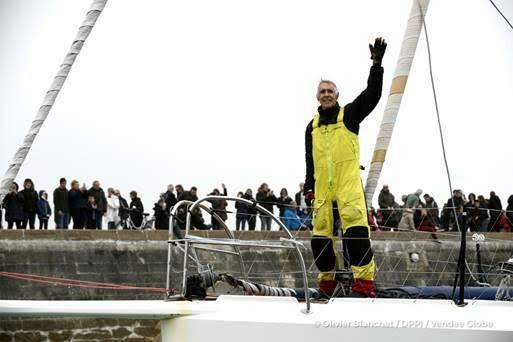 Sailing solo for nearly 27,500 miles aboard Great American IV, Wilson finished the planet-rounding competition in just over 107 days, returning to the west coast of France on Tuesday, February 21, 2017 after having started there on November 6, 2016. He finished 13th out of 29 boats and thus became the fastest American to race solo non-stop around the world. Wilson has been a CCA member for 38 years (since 1979) and holds degrees from Harvard and MIT. Along with being a lifelong mariner, he has been a math teacher in Boston, a defense analyst in Washington and a consultant for a desalination plant in Saudi Arabia. For more information on CCA, go to http://www.cruisingclub.org.